Asthma is a potentially life-threatening inflammatory disease of the lung characterized by the presence of large numbers of CD4(+) T cells. These cells produce the Th2 and Th17 cytokines that are thought to orchestrate the inflammation associated with asthma. Bee venom (BV) has traditionally been used to relieve pain and to treat chronic inflammatory diseases. Recent reports have suggested that BV might be an effective treatment for allergic diseases. However, there are still unanswered questions related to the efficacy of BV therapy in treating asthma and its therapeutic mechanism. In this study, we evaluated whether BV could inhibit asthma and whether BV inhibition of asthma could be correlated with regulatory T cells (Treg) activity. We found that BV treatment increased Treg populations and suppressed the production of Th1, Th2 and Th17-related cytokines in an in vitro culture system, including IL2, IL4, and IL17. Interestingly, production of IL10, an anti-inflammatory cytokine secreted by Tregs, was significantly augmented by BV treatment. We next evaluated the effects of BV treatment on allergic asthma in an ovalbumin (OVA)-induced mouse model of allergic asthma. 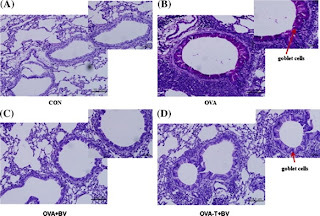 Cellular profiling of the bronchoalveolar lavage (BAL) and histopathologic analysis demonstrated that peribronchial and perivascular inflammatory cell infiltrates were significantly lowered following BV treatment. BV also ameliorated airway hyperresponsiveness, a hallmark symptom of asthma. In addition, IL4 and IL13 levels in the BAL fluid were decreased in the BV treated group. Surprisingly, the beneficial effects of BV treatment on asthma were eradicated following Treg depletion by anti-CD25 antibody injection, suggesting that the major therapeutic targets of BV were Tregs. These results indicate that BV efficiently diminishes bronchial inflammation in an OVA-induced allergic asthma murine model, and that this effect might correlate with Tregs, which play an important role in maintaining immune homeostasis and suppressing the function of other T cells to limit the immune response. These results also suggest that BV has potential therapeutic value for controlling allergic asthma responses.